Welcome to the York Soil & Water Conservation District site. Our mission is to promote the wise and responsible use of natural resources for the benefit of all citizens of York County through education, demonstration projects and technical services. The Conservation District brings together all available technical, financial and education resources and coordinates them so that they meet the needs of the local land user for conservation of soil, water and related natural resources. The Conservation District is a subdivision of state government in partnership with the South Carolina Department of Natural Resources and the USDA Natural Resource Conservation Service. 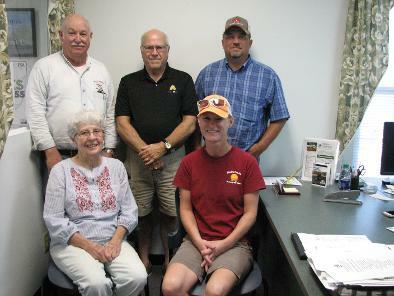 The York Soil & Water Conservation District has been serving York County landowners for over 60 years. Learn more about our programs through our most recent newsletters. The Conservation District consists of a board of five commissioners - three elected in the general election and two appointed by the South Carolina Department of Natural Resources. Commissioners volunteer their time, talents, and services to help improve natural resource awareness. Commissioners meet every other month on the 3rd Tuesday of the month at 10:00 a.m.
All board meetings are open to the public - individuals wishing to attend should call the office to confirm date and time. Commissionerspictured left to right: back row: C. W. Senn -Treasurer, Bennie Copeland, Michael Nance - Vice-chairperson. Front row: Peggy Palmer & Beth White -Chairperson.